When it is time to talk about trailers, the word teardrop trailer is very recognized due to its history, its economic value, easy creation, and fascinating design. The teardrop is the smallest of the trailer family and relies on homely comforts, with a modern design capable of guaranteeing its owners the necessary stability so that it may be used in different ways. For those people who love to travel whether it is alone, with your couple, or in the company of the whole family, this trailer is the most ideal since it relies on a design capable of providing within its interior the perfect space to rest making room for people just over six feet tall. It is common to find in its interior a bed that accommodates two and various drawers in the uppermost part of the bed with the purpose of optimizing space and allowing more organization and space within this small trailer. For this reason, the majority of people that acquire their teardrop trailer use it to sleep in when they travel far from the city. This use has become widely famous due to many people who anxiously await the weekend to free their mind and breathe fresh air. Another one of the most common uses given to these trailers is that a great part of North America, people simply love to live inside of them because of their economic value not only when it comes to purchasing one, but also because they rely on rechargeable energy, there is no rent needed, and the majority of people tend to build it with their own hands according to their taste. All they need are the plans, and to determine its design and the space you wish to have available for your perfect home on wheels. On the other hand, people use the famous teardrop trailer to tug heavy objects. They can also be changed according to their immediate need since they rely on ideal characteristics, for example, its lightweight material and its oval shape guarantee stability on the road providing security for the objects found inside of it. All of this allows for it to be pulled around by almost any vehicle, hence not demanding its owners to purchase a specific vehicle for its transportation. In other cases, the trailer can be also used as a food truck allowing start-up food truck businesses to change the location at a given moment. The rear part of the trailer is usually used as a space full of drawers with a peculiar and new design, which allows many people to use the trailer for gastronomic affairs or simple commerce. 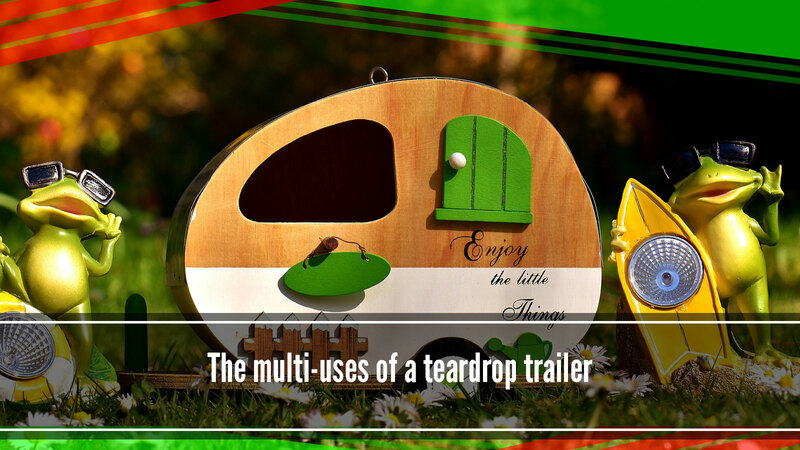 These reasons are why the teardrop trailer is so famous, its multi-uses differentiate it from other trailers. Its aerodynamic design and considering how easy it is to build make many travelers want to acquire one of their own. Today, I invite you to get to know everything that these marvelous trailers have to offer through images or videos online. Although they look small from the outside, you can find the perfect space to live in, when looking at them from the inside. Everything depends on the taste or need of the person seeking to acquire these trailers.